Got leftover chicken wings? Don’t throw them out! Make this soup instead. Colby makes great chicken wings for football games; he’s perfected his technique over the past year. This last time, Colby doubled his recipe.. and brought home a supreme pizza, ice cream, chips, and chocolate! Needless to say, we had plenty of leftovers! I was making buffalo chicken salad sandwiches for him this week (pull meat off the bones, chop, add diced celery, and dress with ranch or bleu cheese dressing), but it got to be a pain to pull the tiny bits of meat off the bones. Determined not to let his tasty wings go to waste, I made this buffalo chicken soup! It’s spicy and very savory thanks to the chicken bones. You could easily make it using chicken breast instead of leftover wings, though! If this is what you’re looking at the day after the Super Bowl, give this recipe a try! Place the leftover buffalo wings in a large saucepan containing the boiling chicken stock. Boil for about 5 minutes, just long enough for the skin to come loose. Use tongs to transfer the wings, one at a time, into a large bowl of ice water. Use your hands to peel the skin off the wings. Throw out the skin and place the meat and bones back into the simmering stock. Repeat for all the wings. Add the water, tomatoes, diced vegetables, bay leaf, ranch seasoning/ salt, and hot sauce to the saucepan. Bring to a boil then cover, reduce heat to low, and simmer for 1 hour, or until all vegetables are tender and chicken is falling off the bone. Lade into serving bowls and garnish with sour cream, bleu cheese dressing, or ranch dressing. PS- you could easily make this recipe in a slow cooker. Simply combine all ingredients in a slow cooker after skinning the chicken wings and cook on high for 3-4 hours or low 6-8 hours. Enjoy!! By the way, do you like my snazzy new photography setup? I picked up the supplies at Lowe’s: piece of drywall, white subway tile, marble tile, tile adhesive, and caulk. It only took about 30 minutes to build, so I’ll probably make another setup sometime soon! I think dark wood, sandstone, or slate would look nice. Does your slow cooker need a little attention? I was inspired to dust mine off after teaching a cooking class with the UNLV Nutrition Center this week. We showed families how to use a slow cooker to make brown rice, healthy fruit compote, and a variation of this delicious soup! It started out as a chicken tortilla soup, but the idea of an enchilada soup had me drooling. I tweaked a few things to make this soup a healthy comfort food. To make this soup cheesy yet lower calorie, put the gooey stuff where it counts- on top! By broiling the cheese on top of the soup rather than in the broth, you get all the flavor hitting your palate right away without getting diluted. The golden cheese topping makes this dish reminiscent of french onion soup. The classic latin American flavors shine through, so I hope you’ll curl up with a bowl of it on a night that you’re craving Mexican food! Combine chicken, vegetables, chicken stock, water, and spices in a large slow cooker. Cook on low for 6-8 hours or high 3-4 hours. Preheat oven (or toaster oven) to 400 degrees. Cut corn tortillas into slices or strips, spritz evenly with canola oil spray, and lay in a single layer on a baking sheet. Bake for 10-15 minutes until golden and crispy. When ready to serve the soup, ladle into ceramic bowls and top each portion with one with 1 oz of shredded cheese. Broil the soup until the cheese is bubbly and golden. Top with tortilla crisps and serve with cilantro, lime, sliced avocado, and/or sour cream. **I forgot to put the tortilla strips on my soup for photographs.. dang it! I’ll get it right next time. And here it is all dressed up in its glorious cheese crust… mmmmmm…. Bored of the same old flavors when eating clean? Try this bold dish to excite your taste buds! This month’s Recipe ReDux theme is using new ingredients. My recipe features THREE new (to me) ingredients/ tools. –Tagine (tajine)- This is an earthenware pot in which the North African dish by the same name is cooked. Traditionally, this clay pot is placed over hot coals and is used in a cooking method similar to roasting. 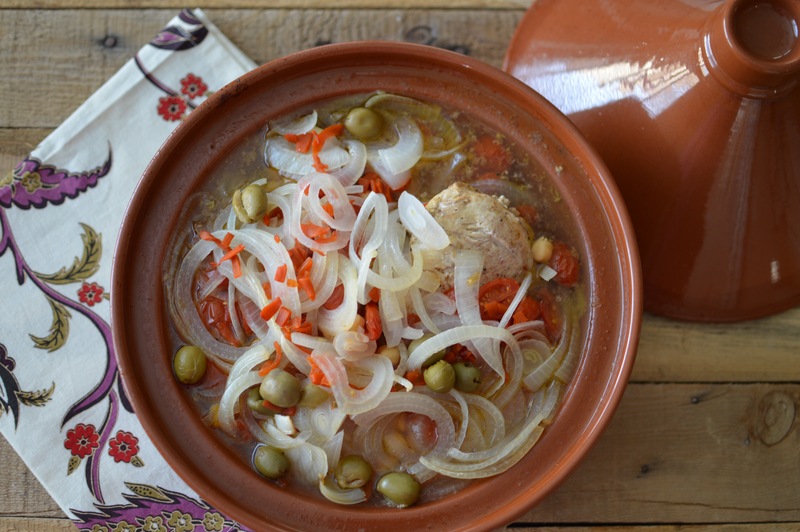 In this recipe, I place the tagine in the oven. The cone shaped lid helps any condensation that forms return to the bottom. A similar result can be achieved by using a slow cooker! 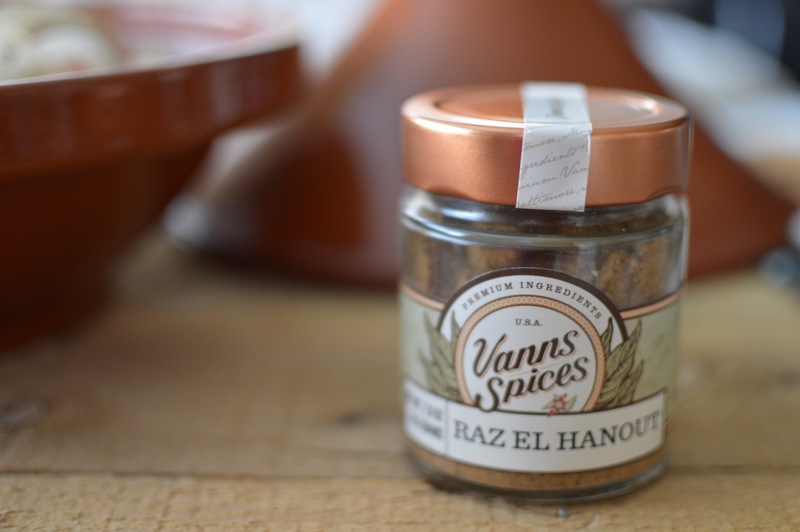 –Raz el Hanout- This is a spice mix used in North African (typically Moroccan) dishes. It means “head of the shop” (or top shelf), referring to the best spices the seller has to offer. It is traditionally rubbed on meat or stirred into couscous or rice in savory dishes. The blend that my sister found at World Market is made of ginger, pepper, nutmeg, cinnamon, allspice, cayenne, and… “other spices”?? These are most likely cardamom, cumin, and/or coriander. Big, bold flavors here! –Kamut (khorasan wheat)- Traditional Moroccan tagine is served over couscous or plain white rice, but I decided to try out a different whole grain to shake things up a bit. This ancient grain is rich in protein, fiber, B vitamins, and manganese (an essential mineral). 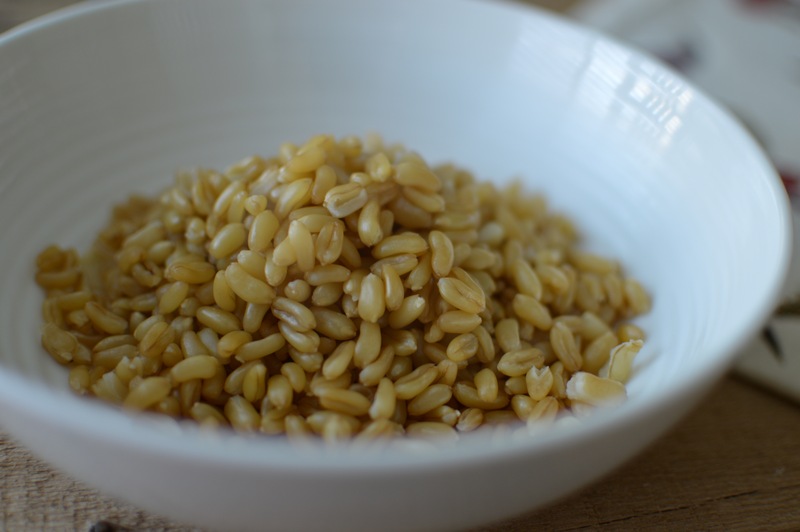 Half a cup of cooked kamut has only 140 calories and 6 grams of protein- that’s about 40% more than wheat! Kamut is not gluten free. Its flavor is slightly sweet, nutty, and buttery. The texture is pleasantly chewy with a bit of a bite. I’ll be trying it in a salad next time! Ready? 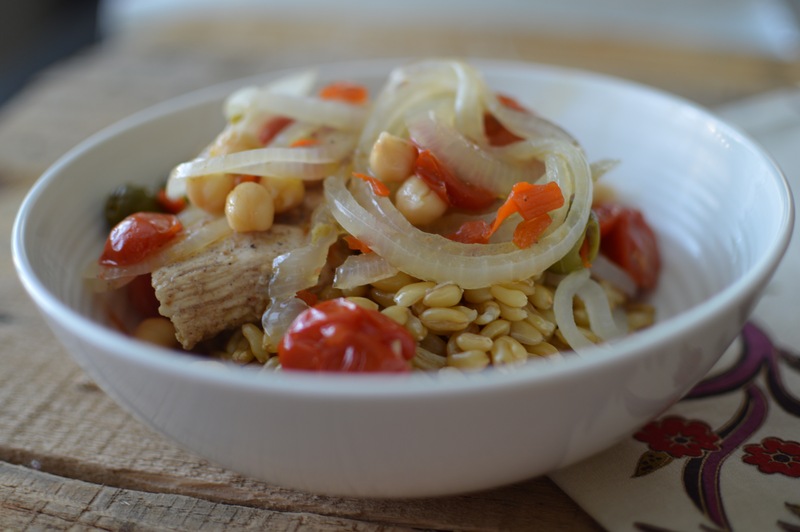 Here comes the recipe for a delicious dish bursting with flavor! If you’re eating healthy and ready to try something new, this is the meal for you! Pound the chicken breasts with a mallet on a cutting board to 1″ thick. Cut each breast into 4 chunks. Whisk together raz el hanout, honey, garlic, chili flakes, olive oil, lemon juice, and salt in a glass dish. Place the chicken breasts in the mixture, coat well, cover, and refrigerate 8-12 hours. Combine Kamut and boiling water in a saucepan. Simmer on low heat, covered, for 1 hour. If using a slow cooker, do this step about an hour before serving the meal. If using a tagine, preheat the oven to 350 degrees. While the kamut cooks, pan fry the marinated chicken breasts over medium-high heat until golden on all sides. Transfer the browned chicken and remaining marinade into the tagine or slow cooker. 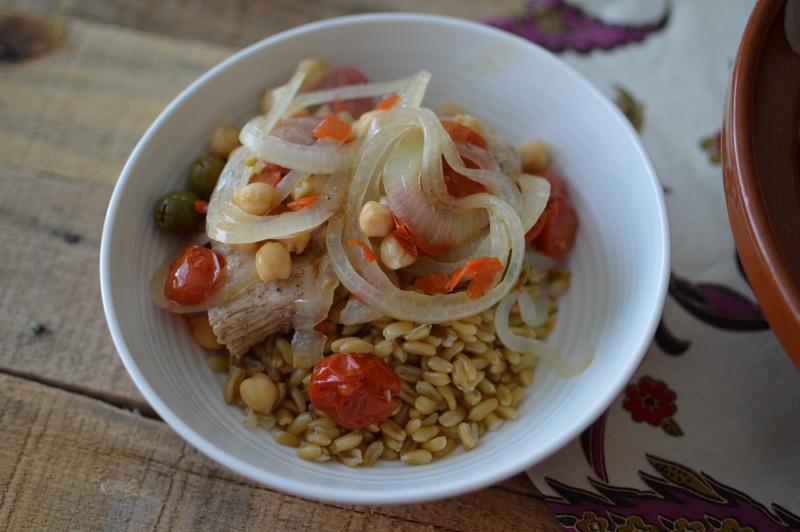 Top the chicken with onions, vegetable stock, garbanzo beans, tomatoes, and olives. If using a tagine, cover and cook in the oven for 1 hour until the chicken is tender and cooked to an internal temperature of 165 degrees F. If using a slow cooker, cover and cook on high for 4 hours or low for 8 hours. Serve over cooked kamut topped with fresh cilantro, salt, and pepper. The flavors in this dish are vibrant an unique! I’m looking forward to trying other dishes cooked in the tagine. Check out the links below for other recipes developed by the Recipe ReDux crew!